ADVENTURES WAIT JUST DOWN THE TRACK. "WE'RE OFF!" THEY SAY. "BUT WE'LL BE BACK!" 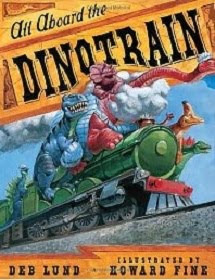 As clearly promised in the previous dino-adventure, Dinosailors board book Houghton Mifflin, 2011), the spirited saurians are off for another trip--this time by train. The motley crew, striped railroad caps and overalls and all, clamber atop the railroad cars and chug away. With tons and tons of dinos aboard, their train is clearly stressed. no express. In fact, as they begin their climb up into the beckoning snow-capped mountains, the dino-crew find that they have to provide a bit of motive muscle to the mix. "WE THINK WE CAN!" THEY DINOSAY. "OUR DINOMIGHT WILL SAVE THE DAY." But even dino-motivation can't quite come up with the motion until they dino-download some dinofreight. At last they make the peak. Now they're rolling! AND WAVE THEIR DINOARMS WITH GLEE. But the dinoglee is short-lived. Careening down the other side of the mountain, they are greeted by a frightful dinosight! "THE TRAIN WON'T STOP. THE TRESTLE'S OUT!" Yep, it's another dino-disaster! On sea or land, it seems the travellin' saurians are bound to wind up soggy. As the train makes the hurdle over the broken bridge, its crew dinorockets off the bridge, to land--where else? in the dino-drink again! WE THOUGHT THIS TRIP WAS WATER-FREE!" BUT HOW ABOUT... A DINOPLANE?" Howard Fine's glowing gouache and watercolor illustrations, filled with up-to-date dino morphology and markings, fill the pages with dino delight in this forthcoming new board book edition of Deb Lund's jolly rhyming All Aboard the Dinotrain board book (Houghton Mifflin, 2011). And true to the form of the previous book, barring an asteroid strike in dinoland, these dinotrippers will be taking flight for their next transportation tale.